I am the lucky recipient of 410 Memos during a 35 hour time period. From August 9th at 11:01 PM until August 11th at 10:10 AM, this website was under a brute force attack by person or persons unknown. I was REALLY busy with multiple deadlines. I knew there was a solution that I could implement to help alleviate the pain that the server must be feeling, but I also knew that the firewall was doing its job, by thwarting and notifying. So, I let it keep until this morning. 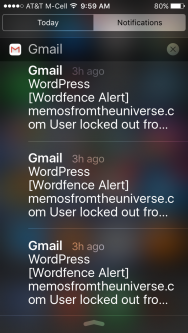 During the 35 hour period that my phone was pinging regularly with emails from the firewall, the subject of self-publishing came up more than once. The most prominent occurrence was last night. I had “set phasers to stun” (silenced the phone) while in a business meeting. At the end of the meeting, several attendees were standing around talking about self-publishing, and the phone kept vibrating in my pocket at regular intervals. I wonder what I’m supposed to be self-publishing? Previous PostBeginning again. And again. And yet again!